I read this article and found it very interesting, thought it might be something for you. The article is called Heart Disease Kills 1.7 Million Indians, Continues To Be Top Killer in 2016 and is located at https://archive.indiaspend.com/indias-great-challenge-health-sanitation/heart-disease-kills-1-7-million-indians-continues-to-be-top-killer-in-2016. Heart disease is still the leading cause of death in India, killing 1.7 million Indians in 2016, according to the 2016 Global Burden of Disease Report, released on September 15, 2017. 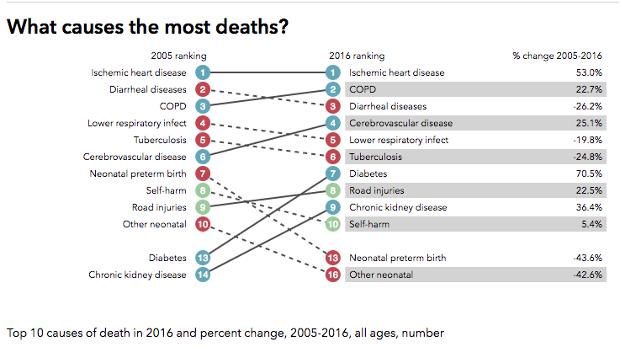 As India reduces under-five mortality and deaths due to infectious disease, it faces the emerging challenge of non-communicable diseases, such as chronic obstructive pulmonary disease, cerebrovascular disease and diabetes, which have been increasing over 10 years to 2016. India cut death rates from diarrhoea, preterm birth, tuberculosis and neonatal disorders, indicating improvements in some aspects of the public healthcare system. Mostly, heart diseases arise due to the presence of low dissolved cholesterol in the blood which mainly contributes to heart blockages. This is mainly found in fatty foods like cheese or sweets. Hence, the problem also points to eating habits. Also, lack of exercise and mental stress may have major role in heart related diseases. Therefore, change of life style may reduce the rising number of patients affected by the disease. This is why India is called the diabetes and coronary heart disease capital of the world. Many CVDs are preventable with lifestyle changes like stopping smoking, regular exercise and eating a healthy diet. The important thing to do is to keep track of your health by regularly monitoring your BP, and taking medicines prescribed by the doctor.